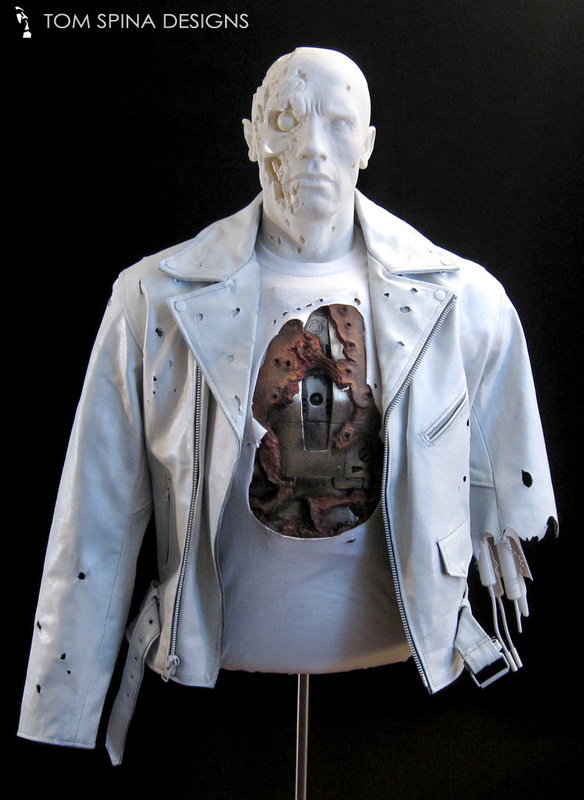 A stylized custom movie prop display for an original Terminator 2 endo chest worn by Arnold Schwarzenegger. 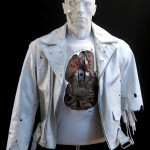 Our client had this original Terminator 2 endo chest piece and was looking for a unique way to display this unusual prop. 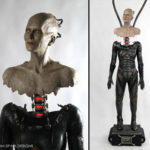 This foam latex and fiberglass chest piece was worn by Arnold Schwarzenegger as the title character in the film, to show his mechanical endoskeleton through his “flesh” when he was wounded. 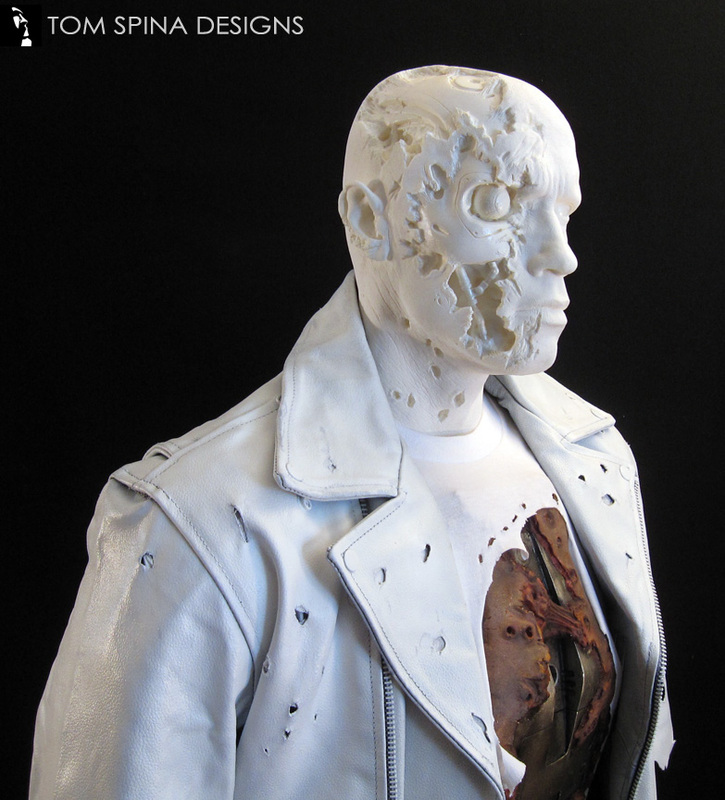 Rather than create a wax figure style statue of Arnold, we suggested our client go with a single toned display where the screen used prop – the chest piece – would be the only full color element and remain the star of the display. 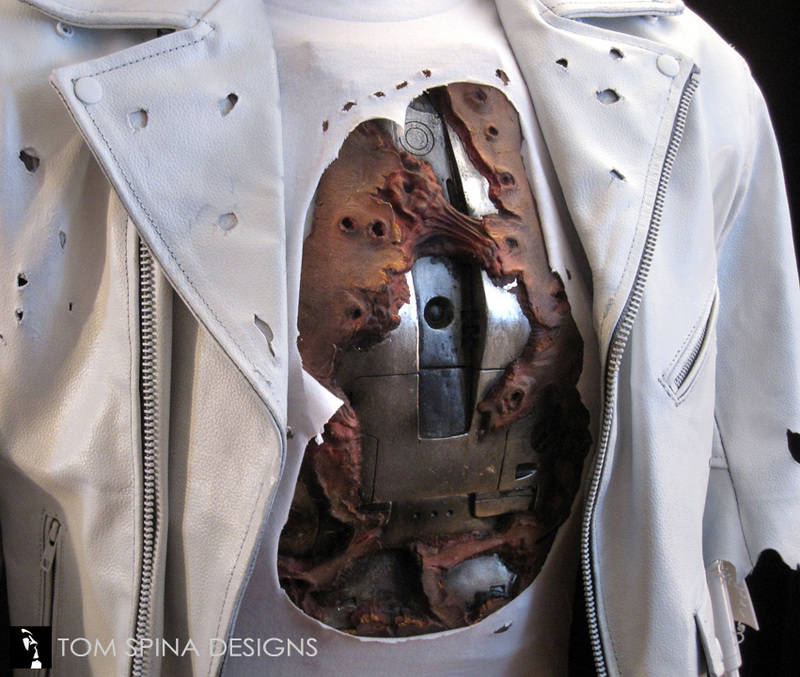 This approach also helps show how the prop was used in the movie. 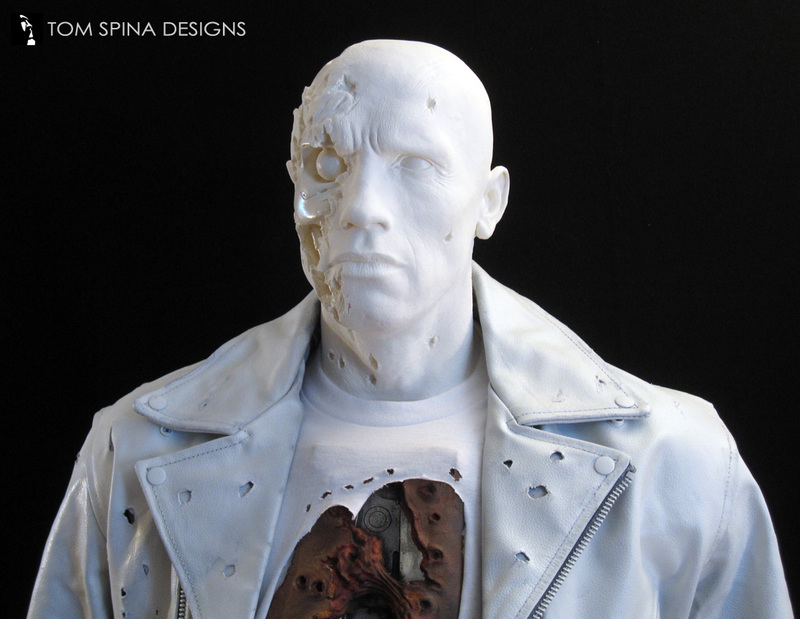 Through our contacts in the sculpture and FX community, we sourced a bust of Arnold Schwarzenegger which was made from a casting of a production head made by Stan Winston for Terminator 2. 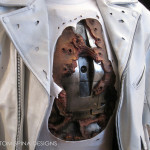 We then attached that to a custom torso, which we bulked up to match the actor’s hulking physique! 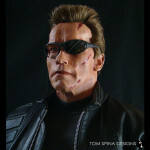 You can’t display an Arnold costume on a standard retail mannequin! 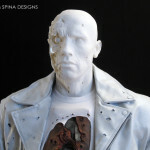 We added a custom created “severed endoskeleton arm” to one side, reflected the T-800’s look at the end of the movie. 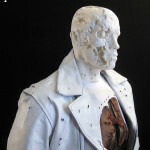 We used reference photos and screen shots to help us recreate the jacket and t-shirt and properly distress them with appropriately placed faux bullet holes and tears. 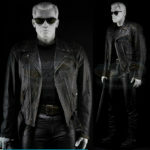 We found a jacket that closely matched Schwarzenegger’s original costume in black, and then repainted to match the otherwise entirely white display. 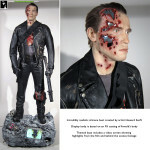 The result is a beautiful, clean display that showcases the original prop Terminator 2 endo chest element beautifully in context and gives viewers and instant appreciation for how the prop was worn in the movie. 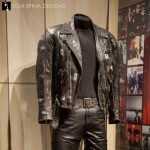 It also makes it very clear what elements are screen used and what elements are there to enhance the prop’s display. The display has arrived safe and sound and I finally got a chance to unpack it last night. 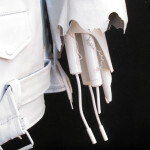 Firstly your packing job was fantastic, everything was in pristine condition and totally protected so thank you for that. 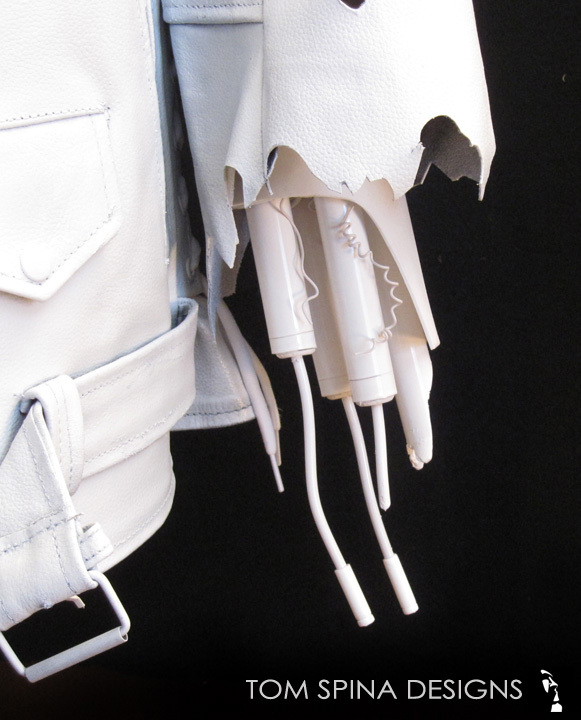 Once I actually got it all unwrapped and assembled it looked amazing, and even more striking in person than in the great photos you sent me.